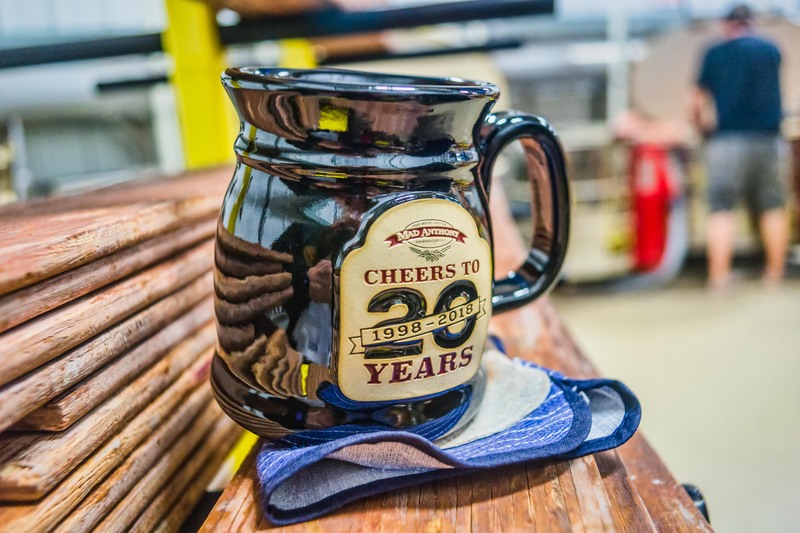 Sunset Hill Stoneware has been turning clay into mugs and beer steins since 1998, making 2018 our 20th year in business. In continuing with our year-long celebration, we're highlighting another company that's also observing its 20th anniversary this year and to whom we're proud to supply our stoneware: Mad Anthony Brewing Company. Mad Anthony Brewing Company began as the brainchild of owners Todd Grantham and Blaine Stuckey. Together, they started with a rented space inside of another local restaurant called the Munchie Emporium in Fort Wayne, selling their beer to the restaurant in 1998. Along with menu expert Jeff Neels, who joined the group in 1999, they eventually purchased the restaurant and set out to create a brew house in the space. As for the brewery's name, Mad Anthony was coined as a direct reference to the Revolutionary War veteran General "Mad Anthony" Wayne, who earned his moniker through a string of daring military campaigns and a fiery personality. Since he's the namesake for the town of Fort Wayne, Todd and Blaine decided to name the brewery after the general's nickname. Eventually, demand forced Mad Anthony to move its production space to a separate facility in the lot behind the restaurant. However, part of the original brewery is still located inside the restaurant, and several craft brews are produced there. Eventually, Mad Anthony Brewing Company grew even more, establishing more locations throughout northern Indiana. Today, the brewery can be found in Fort Wayne, Auburn, Warsaw and Angola. The company has also opened a barbecue restaurant with two locations aptly called Shigs in Pit. "We're always trying to expand," said Josh Volz, director of marketing at Mad Anthony Brewing Company. He added that the brewery has seen tremendous growth in the quality and quantity of its brews over the years and is always trying to get its name out there. Today, the Mad Anthony crew produces more than 2,500 barrels of beer annually. Mad Anthony supplies 23 beers at its main location and offers between 12-14 of them at each of its satellite locations in the greater Fort Wayne and northeast Indiana areas. Some of the beers they offer, like the Summer Daze and Jonesing for Java, are even seasonal exclusives. "We've been lucky enough to win a few awards," Volz said. "It's always cool to be able to come back home with some medals." Mad Anthony Brewing Company's Auburn Lager has won gold at the Great American Beer Festival in 2015 and 2017, and also won the Indiana Brewers' Cup Lager competition in 2015. In addition to having award-winning beer, Shigs in Pit is also a 12-time Kansas City Barbecue Society grand champion. The brewery also hosts events throughout the year, including live entertainment and an annual crawfish boil early in the summer. Be sure to stay tuned on the company's website for upcoming events, since there is always something going on at each of its four locations. Sunset Hill Stoneware has been working with Mad Anthony for years to supply custom coffee mugs for their mug club and as merchandise for their customers. Volz explained that when they first discovered us, the quality of our products and the working relationship Mad Anthony built with our customer care team drew them to our mugs. "The quality of the mugs is fantastic," Volz said. "The artwork always turns out great. All of our mug club members have been super happy to take them. It's something they do take home and cherish." Volz added that Sunset Hill Stoneware's customer service stood out, especially the ease of the ordering process and the selection of styles they had to choose from for their mugs. 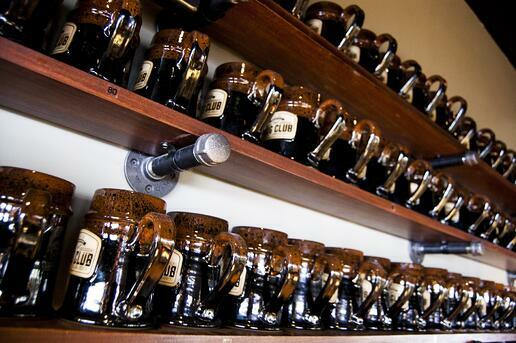 There are usually plenty of Mad Anthony logo mugs and steins up for grabs at most of the brewing company's locations. 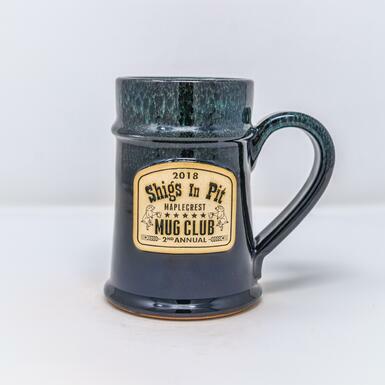 However, members of the mug club also have access to more exclusive designs every year included in their membership. 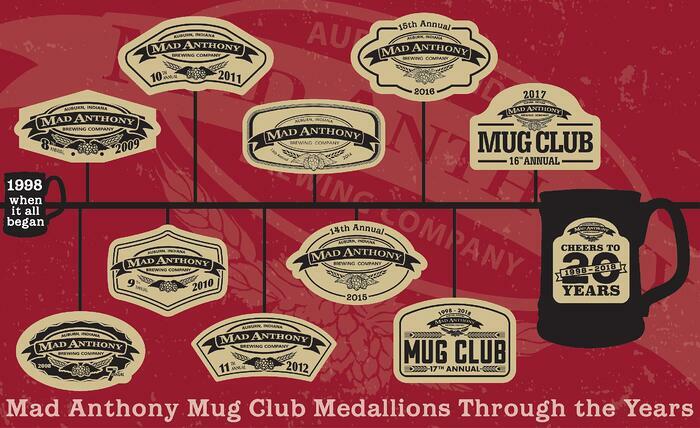 In order to join Mad Anthony's annual mug club, members just have to pay a small fee. In exchange, they have access to special parties and mug club nights, discounts on beer fest tickets, first dibs on new or limited releases and more. Plus, the mug design changes every year, so members can always expect to see something new coming out. "I always enjoy choosing the style every year," Volz said. "It's a really fun time of year when that comes around." 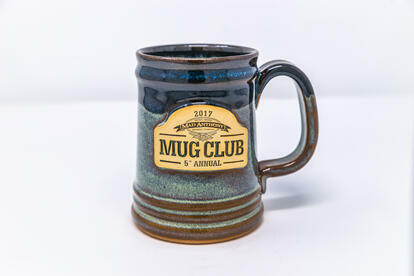 To see our full line of handmade ceramic mugs and steins and consider which styles are best for your brewery, click the link down below.